Creative have long been a household brand developing audio products for as long as many can remember and they have had a long standing relationship with gamers specifically with the SoundBlaster brand and currently the Sound BlasterX branded products. So it is only natural to move further into the realm of gaming by developing high quality gaming peripherals. The Creative Sound BlasterX team designed and built the Siege M04 from the ground up after spending many years researching the habits of gamers from all over the world. Internally, the Siege M04 has at its core the renowned PWM 3360 sensor which is supported by a fast 32bit MCU. It features an ergonomically designed shape suitable for palm grips, on-board memory, 7 programmable buttons including a sniper button/dpi toggle, and a fingerprint resistant surface with textured rubber grips at the sides. As it is 2017, this premium mouse also features Creative's Aurora Reactive (as seen on the Creative Sound BlasterX Katana) lighting that has 6 different lighting effects, and a total of 7 points where the RGB LED lighting can be customised. The Sound BlasterX Siege M04 is our flagship gaming mouse. Armed with a gaming grade PMW3360 IR LED, it boasts a 1000 Hz polling rate and 12,000 native DPI that flawlessly tracks every minute hand movement with no inherent acceleration and prediction to ensure pixel perfect precision and a low lift-off distance. 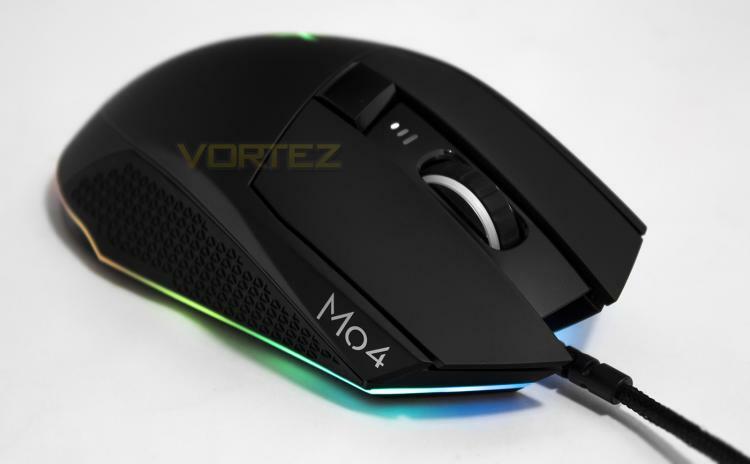 Designed ergonomically for right-handers, the Siege M04 fits snugly within your palm and suits palm or grip players. Its non-slide matte surface is fingerprint resistant, while its rubber-based textured regions provide the perfect grip - so this mouse won’t be going anywhere you don’t want it to. Equipped with all-edge LED lighting, the matte black Siege M04 is powered by the Aurora Reactive Lighting System that features fully customizable 16.8 million colours.